The Recurvirostridae is a small family of shorebirds with representatives found around the world. All members are long-legged, long-billed, and all are pied black-and-white in at least one seasonal plumage. The world's four avocets — genus Recurvirostra — have upturned bills; all the world's stilts have straight bills. 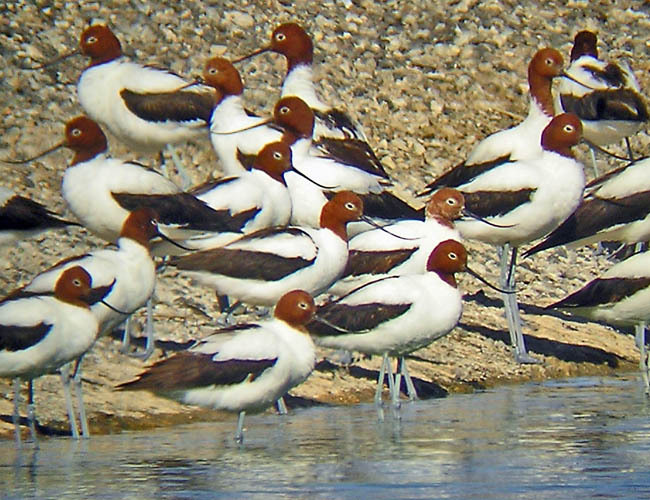 Among the four avocets, two species, including Red-necked Avocet of Australia (left), have a distinctive breeding plumage with head and neck washed with orange or rusty-red. All the rest of the family (but one) have simple black-and-white plumage patterns, as does the widespread Black-necked Stilt of the New World (below). The exception is the endangered all-black Black Stilt Himantopus novaezelandiae, endemic to South Island, New Zealand. and the endangered New Zealand Black Stilt. Various members of the family have loud calls and aggressive behaviors when breeding (e.g., the Black-necked Stilt below is berating the intruding photographer). 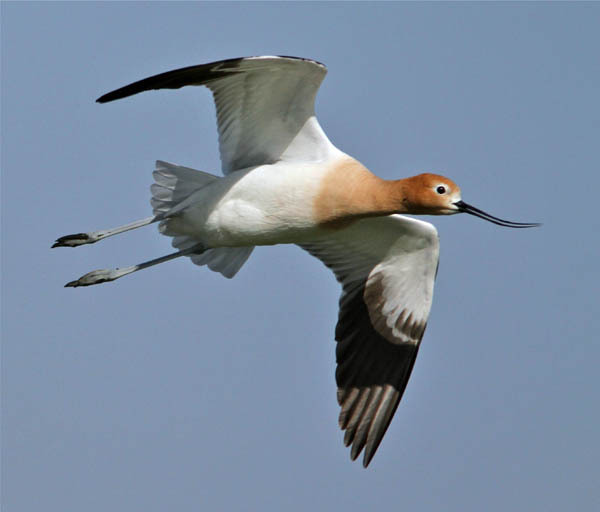 In American Avocet (above) there is sexual dimorphism in bill shape. Females (above left) have decidedly upswept bills, more similar to that of their Old World counterpart, the Pied Avocet (right). American Avocet males (above right) have long then bills with a comparatively shallow upturn. Both sexes lose the orange head and neck in winter. Avocets scythe the murk in shallow ponds for invertebrate (often free-swimming) prey; stilts pick more daintily, both in the shallows and regularly along the edge. While there is comparatively little debate about the taxonomy of the world's four avocets [the one not illustrated here by photos is Andean Avocet Recurvirostra andina of South America], there is little agreement about species-level taxonomy in the stilts. Leaving aside the unique Banded Stilt Cladorhynchus leucocephalus of Australia, some would lump all other stilts into a single species Himantopus himantopus, the name first in priority (e.g., Bock & Farrand 1980, Pierce 1996; the call it "Pied Stilt"). Most now restrict Himantopus himantopus to the Black-winged Stilt of the Old World (below). Sibley & Monroe (1990) noted that "most allopatric forms [of stilts] differ in morphology, behavior or vocalizations" and they divided Himantopus into five species of stilt: the Old World Black-winged Stilt, the New World Black-necked Stilt, the southern South American White-backed Stilt H. melanurus, and the Malay/Australasian White-headed Stilt H. leucocephalus, and the endemic Black Stilt of New Zealand. In yet another approach, the A.O.U. (1998) separated the Old World and New World taxa, but lumped the South American leucocephalus with mexicanus due to limited hybridization. Assuming one separates the major allopatric taxa into species, by what criteria does one continue to lump the unique resident Hawaiian form with North American mainland birds? Yet that is the position taken by many recent authorities. 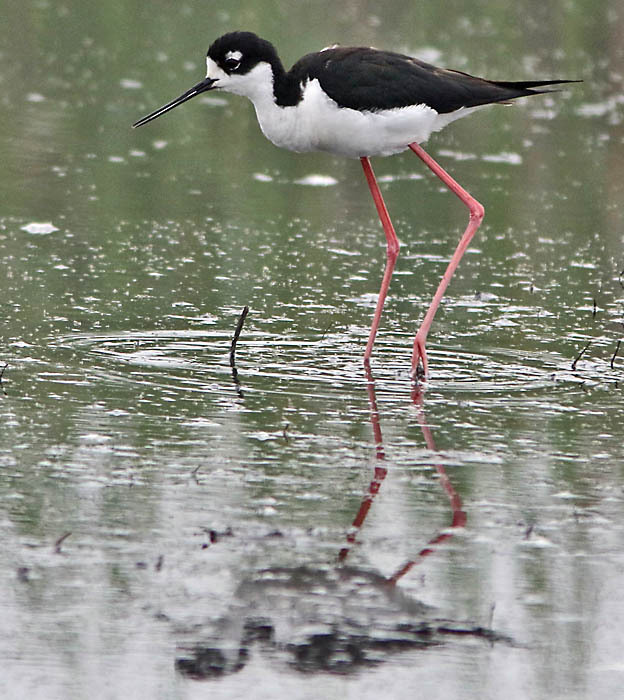 The "Hawaiian Stilt" (below) is quite similar to Black-necked Stilt, but differs from mainland birds in having more black to the neck and face. It is also an endangered taxa, now restricted to the few wetland locales remaining on the islands. Taxonomy aside, all members of this family are elegant and distinctive birds. Their striking plumage patterns present opportunities for classic reflections on calm shallow pools in which they feed, such as this Black-necked Stilt (right). A number of species breed in loose colonies which can be impacted by mammalian ground predators. 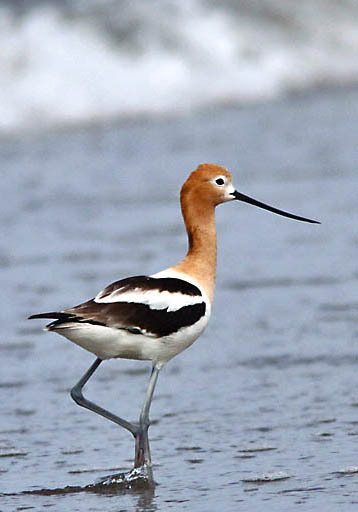 Here in Monterey County where I live, the local species of both stilt and avocet regularly nest at the Salinas River mouth. During the 1980s these populations were almost extirpated by non-native Red Foxes which had invaded this county. Only a vigorous trapping program that controlled the predatory foxes permitted local populations of stilts and avocets to rebound, thereby saving them as well as our local breeding Snowy Plovers — a federally Endangered species (details in Roberson & Tenney 1993). Photos: The densely-packed gathering of Red-necked Avocet Recurvirostra novaehollandiae was at Alice Springs, Australia, 18 Aug 2008. The flying Black-necked Stilt Himantopus mexicanus was near Salinas, California, USA, on 16 June 2006. The female American Avocet R. americana was near Salinas on 20 Apr 2013 and the male at the Pajaro River mouth, California, on 7 May 2015. 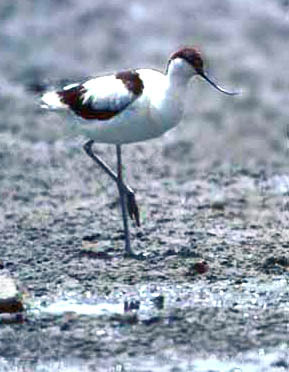 The Pied Avocet R. avosetta was at Lake Nakuru, Kenya, on 17 Nov 1981. 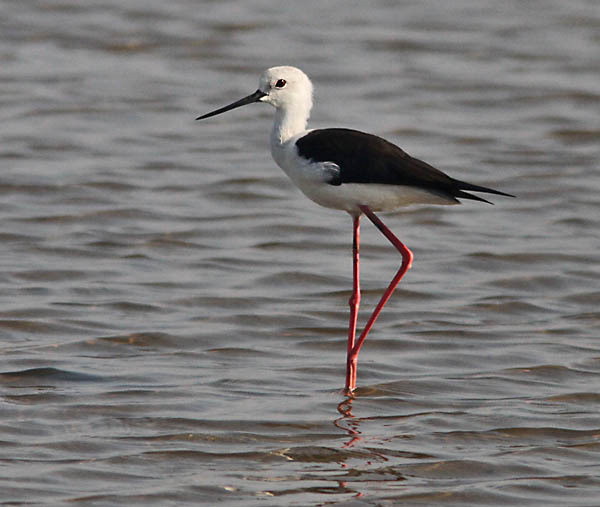 The Black-winged Stilt H. himantopus was in winter plumage at Pak Thale, Thailand, on 22 Dec 2012. The "Hawaiian Stilts" H. m. knudseni were at protected wetlands on Maui I., Hawaii, on 27 Dec 2011. The final Black-necked Stilt H. mexicanus was at Zmudowski SB, California, on 26 June 2016. This book covers all the Charadriiformes — not just stilts & avocets — and so includes plovers, sandpipers, jaçanas, thick-knees, and pratincoles. It is not a "family book" per se, since its focus is on identification problems, but it does include sections on "habits" and migratory or seasonal "movements." Breeding biology and similar topics are not covered here. John Marchant gets special credit for the text — an upgrade from his 1977 guide (with Prater & Vuorinen) — which surveys the literature well and is based on much original research. Hayman's paintings are just fine for stilts & avocets. However, for a real introduction to this small and separate family, see Pierce (1996). American Ornithologists' Union. 1998. Check-list of North American Birds. 7th ed. A.O.U., Washington, D. C. Bock, W. J., and J. Farrand, Jr. 1980. The number of species and genera of recent birds: a contribution to comparative systematics. Am. Mus. Novit., no. 2703. Pierce, R. J. 1996. Family Recurvirostridae (Stilts & Avocets), pp. 332–347 in Handbook of the Birds of the World (del Hoyo, J., A. Elliott & J. Sargatal, eds). Vol. 3. Lynx Edicions, Barcelona, Spain. Roberson, D., and C. Tenney, eds. 1993. Atlas of the Breeding Birds of Monterey County, California. Monterey Pen. Audubon Soc., Carmel.